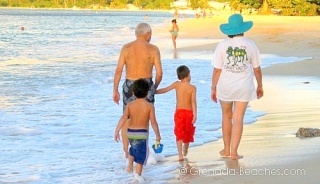 A Caribbean Vacation on Grenada’s Beaches… Can It Get Any Better? I spent 10 days on The Top Grenada Beaches . But the beaches were only the icing on my Grenada vacation. Sure the icing was sweet, but the cake itself was deliciously fun filling. And that’s what this site is about: Delicious Grenada and the Sweet Grenada Beaches . Kids, More traffic, and Lousy Weather!!! So go on, take a break, and come to Grenada. Stay as long as you like (or can afford), and let this sweet, charming little island rejuvenate your soul, and spice up your life. There is plenty to do, and see in Grenada. Even though I spent the first 21 years of my life in Grenada, I’ve only scratched the surface of things to do and see. Grenada is tucked away in the south eastern Caribbean (and we like it like that), but traveling to Grenada is still easy. into Maurice Bishop International Airport (GND), which means Grenada is easily accessible to you. And once you are here, the superb network of roads make getting around Grenada easy. No part of this lovely island is out of your reach. Grenada is visually stunning; it has character; it has variety. From it’s white and black and beaches that mark its jagged coastline, to the dense forest, lakes, and waterfalls, that the hikers worship, Grenada welcomes everyone. Are you ready to taste Grenada? Fantastic!!! Grenada Beaches is the only guide you need. Use the navigation buttons at the very top or to the right to get started. Also click here to find out more about me, and the fastest way to get the latest updates from Grenada Beaches. Enjoy the site and your Grenada vacation. And I’ll see you at my favorite Grenada Beaches and hot spots soon. As I surfed the internet looking for information about Grenada. I came across your website. I hail from St.Vincent but I have spent many of my summer vacations in Grenada. I have been living in the United States for the past forty years (Wow!). Contemplating returning to Grenada for about a week .I am writing a book and would need more information about family who once lived there but are now deceased. Hope to travel sometime in January or February. Help in finding a not too expensive but elegant place to stay for a week. Thank you. PS: If you send me a private e-mail I would share the family name. I was in Grenade the first time in October of 1983, with the 82nd Airborne Division and I returned as a civilian on the 10th anniversary in 1993. I am interested in visiting again next October for the 30th anniversary. I am interested in finding out if there are going to be any programs or ceremonies at the Medical School. I am also planning to bring my girlfriend and my mother along. I have talked about the beauty of Grenada so much, they want to experence it first hand. If possible, please, I would like to recieve information on the attractions and activities available. I am interested in lodging also. When I made my second trip, the people i came in contact with were so friendly. I am sorry it has taken me so long to return. The isle of spice where all thin nice, Grenadian born to the bone. i live in Toronto Canada and i have travailed to lots of Caribbean islands but none like the spice isle, none like the rock, the spice isle rock “so we deh”, did you get get to taste our oil down? when ever you go Grenada ask for Oil down that was cooked outside on spice wood, it’s the best, don’t for get the manicou and tattoo “Wild meat”. Tell someone about the spice isle rock, bless!!! Our family is coming to Grenada from the USA for Thanksgiving this November. Will we be able to purchase a turkey to cook for thanksgiving dinner? I was born and raised in Grenada but live in Brooklyn now. I just discovered your site and love reading about home. I returned every year for my vacation, at least 2x yearly. I have not been back in a while since my dad died. About the beaches I have one, a small black sand beach in the village of Marquise, St. Andrew’s. I think you will enjoy your visit, its very quite and if you meet any one it will only be people from the village who won’t bother you. Enjoy your swim. I’m glad you enjoyed the site. Thank you for the comment and for the tip on the black sand beach in Marquis. There are so many more to feature especially the lovely black sand beaches. If you have any pics and would like to share them with is please email them to me, I would love to post it here. Sorry to hear about the passing of your Dad. Hope you find some time (or reason) to resume your annual visits. This message is for anyone in Grenada who is aware of the whereabout of my cousin Frank John of Hermitage, St Patricks. My last contact with him was the mid eighties in St. George’s. I would love to reunite with him. I am hoping he is well, and is in Grenada. PLEASE,KINDLY TELL ME MORE ABOUT GRENADA,I AM A FIRST TIMER TO MAKE A VISIT. I WANT TO KNOW WHAT IT TAKES TO COME TO GRENADA FROM NIGERIA,I REALLY LOVE THIS COUNTRY FROM WHAT I HAVE HEARD ABOUT THIS BEAUTIFUL COUNTRY,GRENADA,I WOULD BE DELIGHTED IF YOU CAN TELL ME THE REQUIREMENTS TO LIVE AND WORK IN GRENADA. I am a full blown Grenadian woman and I have been away for a few years in a non english-speaking European country and I would like to say that whenever people come to visit my Island they should treat it with respect. We Grenadians are a morally correct people and do not stand for slackness. Do not be afraid to pull them up whenever you see them disrespecting our beautiful island. Until I return keep Grenada clean and safe. Nuf luv. I so want to love Grenada I am glad to see all the things I can do there I left when I was eight and returned about two times but I never experience too much. Next time I will. Skyrone Scopio, all I have to say is welllll said. Yes, WELLLLLL SAID. Gooch, thank you for this voice to my people. Sometime we simply grab things for the net without stopping for a moment to realize that it simply did not jump off the place where it originated onto the pages on the web . So in acknowledgement of your great work in bringing memories of both my childhood and birthplace to be readily available for viewing and other uses like that which I did. My sincere Thanks and continued success in your endeavors. We’ve lived here for nearly 4 years and its amazing!!! The beaches are the best and it’ll be one of the things I miss when we move!!! But, if you can, look for us on SGU Market! Gooch, How are you? man I/m missing Grenada big time. 2 years away much too long. I was hoping anyoneone out there in Cyber-Grenada would like to share a Pumpkin Soup recipe. plenty of pumpkins here in the northeast and plenty of Grenadian spices. All I need is the know how. Much appreciated. Jeff I am doing well. It’s been a while and I feel your pain. Wish I was on Grand Anse beach right now chilling under a coconut tree in front of Spice Island Resort looking at St. George’s in the distance, smelling the salt in the air, feeling the sand, and listening to the waves roll ashore. As for the pumpkin soup, I can make it but I do not have a recipe…ask Mr. Google he knows all. As with most Grenadians we don’t cook with recipe… ah dash of that, pinch of this and voila!! Hope you make it back to the spice isle soon. Actually the correct spelling is Sapote. If you do a Google on that you should find lot’s of info. In fact what you really purchased is the contents of the seed that comes from the Sapote fruit. In some countries they discard the seed and eat the fleshy part for the fruit. In Grenada it’s mainly the opposite, the plant is grown and harvested for the contents of the seed. From what I have seen there are many varieties of Sapote. Hey if you find any interesting recipes let me know. I saw the reference to Mountain Spice Sapot on the site that you sent me to, but that hasn’t helped me any either. I agree that it is probably what I have, so I think that I will just try adding some to my next cake. Thanks again! I recently visited Grenada for the first time as a cruise ship port. My husband and I loved the island for it’s beauty, it’s people, and it’s diving. While visiting Grand Etang, I purchased a spice that I was not familiar with. I thought the lady that sold it to me called it “sapua”. It is a large nut – like pod that you shell and grate into baked goods. She said that it is hard to find since Ivan went through, but is valued by locals. I can’t find any infomation or recipes re: it and have determined that I must have the spelling wrong. Any idea what I purchased or how to use it? Thanks! I think the spice you are referring to is locally called “Sapot”. And it’s definitely used in cakes etc. Unfortunately that won’t help you much in your search to find more information about it. There got to be a scientific name for this plant, but I have not been able to find it. The only official reference to “Sapot” relating to Grenada and Spice that I have found is here. I’ll see what else I find out, now you got me curious. Hi Everyone, I’ve been longing for Grenada more than I’ve longed for anything in my life. My family lives in Europe and are taking one year off and spending it in Grenanda beginning this Fall. We have 8, soon 9 children and everyone is excited. It’s been 20 years sinceI’ve been there, so if you have advice for a large family about housing, school, etc, please post it. This will no doubt prove to be an interesting family adventure. Good luck with the planning, and I hope you maintain a Blog to chronicle this journey so we can all learn more about Grenada from your experience. Great work on the blog. It is my first visit to this site, the articles are insightful and make me want to go back (haven’t been back to Grenada since about Summer 2005). would love you and your blog followers to take a look at the work i’m doing over at ‘Golden Caribean’ fan page on facebook. Looking to build up some decent Grenada and Tobago info and imagery there. cheers all. It was really helpful for us to gather together what kind of clothes and money we should bring, I cant wait to go again! It was soooooo much fun! I love Grenada. land of my birth I spent the first twenty three years ofmy life in Grenada. I simply have to comment after my recent visit….D*mn, I love Grenada. I just returned from spending Christmas and New Years. I left Grenada over 30 years ago and have visited on several occasions but never for Christmas/New Year. I so enjoyed my visit that I want to make it an annual event. Being able to sit on a beach on Christmas Eve and partying under the stars for New Years gave me an unbelievable feeling of contentment and joy. You are so right, I came to the same realization about ringing in the New Year under the stars and fireworks in Grenada last year. Glad you had, fun and we can take it to another level next year. Hi Gooch, me and my husband got married on Grenada in November 2008. The island is like paradise and the best place for a wedding! We will definitely come back one day and until that day we can enjoy your website and dream of our honeymoon! This is an amazing site with invaluable information. I come here all the time to check out the reviews, stories and the pictures, especially when I think about the awesome time I had in Grenada in Xmas 2008, which is pretty much all the time, Karma, the Owl, Aquarium …. I can’t seem to get enough of what you have here and I’m looking forward to more. My husband and I have just booked for a trip in January and are counting the weeks down! We have decided to go room only at the REX as we just love going out and about exploring and to stay all inclusive is a waste for us. With that in mind could you advise please if we will need car hire to travel around or is there a nearby bus servise that is good? And is it safe to travel around the island at night, I think where we will be staying we will have to go out and about to eat in the eve, which is fine, we love going to the more local places rather than the big restaurants, cheap and chearful we love!. Yes, taxi/car hire/rental are good options to consider because Rex Hotel is not directly on the main/busiest bus route. Depending on the time of day and where you are venturing out to you will do just fine with a bus service. From the main bus terminal in St. George’s you can get buses to any part of the island. However if you want to do a lot of exploring then best you get a car rental. Grenada is one of the safest destinations in the Caribbean, but as always you will want to take the usual precautions. Consult your front desk at Rex for guidance, and it’s always best to get good directions before you set out to minimize delays and mishaps. Overall I think you will find Grenadians are extremely friendly and places easy to find. Have fun and do write back to tell us how you enjoyed your vacation. I was born in the beautiful Island of Grenada and I currently resides in Houston, TX. I must say that Grenada is one place that i cannot stop visiting. I visit there every year and I have been sending my daughter there every summer since she was 3 years old. she is now 16 and still enjoys it. There’s no place like my home Grenada. The food, sea and sand. That is all i go for. Island of spice is nice!!!!!! Great site and so much information. Coming back to Grenada in October and this is my third time. Each island has different strengths such as verdant scenery, stunning beaches or local nightlife but I think Grenada has a bit of each, the best mix of all. What a fantastic way to spend my birthday, sitting in myc favourite restaurant BB’s that I used to visit in the capital of England London, but far better scenery now on the front in the capital of Grenada! I am blessed to be able to return and I will treasure every moment of every taste of the local cuisine and Westerhall rum, every sound of soca and Calypso I hear and of course the beautiful people and scenery of Grenada. Happy Birthday. That’s awesome that you are returning for your third time in the isle of spice. Between the local cuisine, the Westerhall Rum, and the people I think you’re well covered… have fun and do send us some pics and tell us what you enjoyed best this time around. Hi, just want to say that you host a greate site! I went to Grenada for my first time in jan this year together with an old friend who was born there. I loved it. The people, the food, the nature. The first of January I’m bringing my whole family there…. Now I find your site very helpful, when I am planning my trip….. so thanks…..
We are coming to Grenada in April 2010, I cant wait, I am so excited I have always wanted to come to the caribbean and what better place than grenada. I cant stop looking at pictures of your country it looks so fantastic. But on the down side I know it will be so hard to leave such a beautiful place when our holiday comes to an end. Hi karletta, welcome back. please enjoy your stay. It is wonderful to have you visit again. Please go to the new mall you will find informaion. That mall caters to the tourise. We found a wonderful taxie driver who toured the Island with us. I have recently returned from Grenada. Grenada is still as beautiful as ever, however I was very disappointed to see dogs on Gran Anse beach despite seeing signs advising that dogs were not allowed, (and for good reason). The dogs I saw were using the beach as their own personal toilet. Can their American owners not read!!!! I saw no one patrolling the beach, and I over heard one the owners saying ‘ No one says anything, the dogs are alright’. I was also told that they bring their dogs to the beach at the same time everyday, surley someone must see. Really hope the next time I come I do not have to negotiate where I am putting my feet!!!! Just want to say i have never seen the beaches yet but some day i pray i will. Im from New York and now i live in Colorado for the past 21 years. 6 Months ago i meet this wonderful man and he is from Grenada. The kindest person and gentle hearted person i have ever meet.Never meet a man like him. If all the Island people are like him that’s a blessing. I like all the pictures you show, someday i will be walking on those beaches with the lords blessing. Thanks for the comment and compliment. You’re lucky that Trinidad is so close to Grenada… if you cannot be in Grenada then Trinidad might be the next best place… 20-30 minutes fly to a great Grenada beach and that special spicy charm. I am Grenadian born living in Trinidad for the past 36 years, and visit Grenada as often as I can. I still have lots of relatives living there. To me it is still the most beautiful island in the world, unspoilt and spoilt in different ways, but has that special spicey charm all of its own. This page is so great and you have listed some great beaches. I could go on and on, as a teenager and young adult, I have visited almost all the beaches of Grenada, and you have picked great beaches as your choices, and there are all so beautiful ,and wish that I could come back there to live, but cannot at this time.